This article was originally published in Independent Australia on 22 February 2015. Deputy editor, Sandi Keane, concludes her exhortations to join her as a Twitter “tragic” with 5 easy steps to get you started. Think of Twitter as microblogging. That makes it amazingly simple to set up and be Tweeting within minutes. But if you really want to engage on topics that interest you, keep track of who said what, where and when, file them in orderly columns for instant reference, be notified of responses when you’re working on another program, then you need a tool like TweetDeck or Hootsuite. Go to https://twitter.com/signup. Enter your full name, email address and apassword. Click ‘Sign up for Twitter’. On the next page, select a username. This is your Twitter handle so be inventive (like @Boefblogginon, @GhostofPJK, @TheMurdochTimes or@GeorgeBludger) but remember you can only have 15 characters. When you post a Tweet, viewers will see your name (we’ll come back to that) and your @(Twitter handle). Click ‘Create my account’. You’ll get a confirmation email from Twitter asking you to click the link in said email to confirm your email address and account. 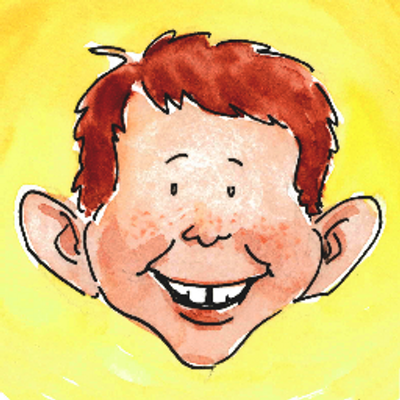 By the way, you can have as many accounts with as many names as you want provided you have separate email accounts. Twitter will help you get started at this point, explaining what a Tweet is, etc. Go to your account. Click ‘Settings’. Under Profile, you might want to consider changing your Name, which can be 20 characters long. Again, be inventive! Who could resist following Coalition Tea Lady (Twitter name @ItsBouquet)? When the Prime Minister announced the reintroduction of Knights and Dames, most of us did an “honours selfie”, recasting ourselves as Lady, Lord or Dame this or that. So here’s your chance to indulge your “inner child” (and annoy your kids…). Don’t forget to post a photo, which can be one of you, your dog, a cartoon, or anything that takes your fancy. Like many Tweeps, I generally don’t follow anyone without some kind of photo. It sits up on your tool bar ready to use whenever you want. 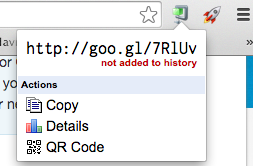 The Google version has a green button which is easy to find. Simply click onto “Copy” and you’re away! Fortunately, “insider” terms are minimal. But keeping Tweets to 140 characters is an art form. So crafting tasty, bite-sized morsels is the answer. Us Over 60s have an advantage here having learned to précis in primary school! You’ll find popular shorthand like “RWNJs” (right-wing nut jobs) comes in handy. DM– Direct message, a private message or “direct message” to a person you follow. LOL– Laughing Out Loud– not “lots of love” like my mother thinks it is. 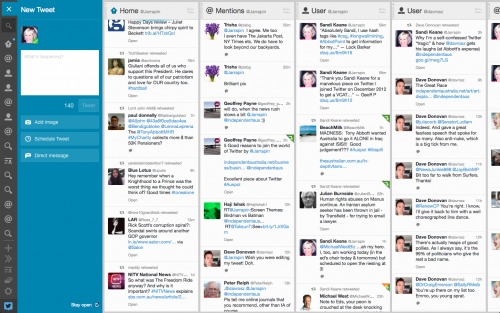 My only experience to date has been with TweetDeck. 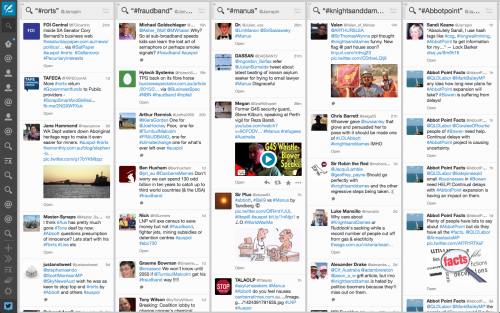 HootSuite has the look and feel of TweetDeck but doesn’t require any downloads. My advice is to compare them both. The advantage of both is to organize and track what’s happing on Twitter. Click onto the Plus + sign in the left-hand menu to set up your columns, starting with your favourite journos, commentators, news sites, etc. I have a separate “User” and “@Mentions” for my favourite Twitter accounts. The number of columns can be reduced by just clicking on “Search” then typing in the Twitter name, eg “@denniallen” (former Labor MP Denise Allen and an IAcontributor). This feed will give you all Tweets mentioning this Twitter handle including those posted by @denniallen. Or for more fun, #Imstickingwithtony which was trending at No. 1 two weeks ago in response to Tony Abbott’s call on his fellow Liberal MPs to “stick with him”. Dave Donovan has had a ball with this! Twitter is definitely THERAPY for Dave! Check him out here! Voilà! Now that you have your columns set up, you can have a conversation you can follow in real time, interact with other Tweeps or simply see how the story unfolds. 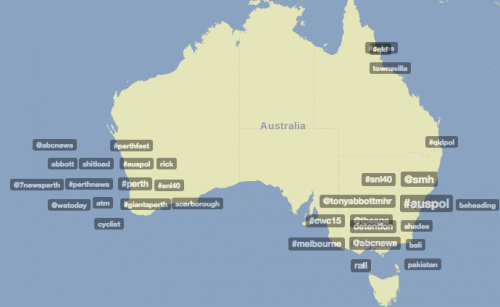 If you want to check what’s trending on Twitter, the easiest (and cheapest) is to go to Trends Australia @TrendsAustralia, Trendsmap Plus @TrendmapPlus or direct to http://trendsmap.com/local/australia. Finding interesting articles to Tweet is a doddle since all online media have a Tweet button at the beginning or end of each article. But remember that your Tweet will be more interesting if you come up with your own comment and use the URL shortener. At IA, we’ve gone one further — you can also Tweet out interesting comments from our comments thread. This automatically links back to the article in question and is a good way to stimulate interest in the topic. I usually post a response to the comment’s author to let them know how much I appreciated their thoughts and that I’ve shared them on Twitter. Dave and I also embed the most interesting Tweets in IA’s articles. So, apart from adding examples of responses to the topic from the Twittersphere, you can also retweet these. What can I do with a Tweet? Apart from retweeting (which you can edit), responding or favouriting, you’ll see three little buttons on the right hand side “…”. Click onto this and a whole new menu opens out for you. 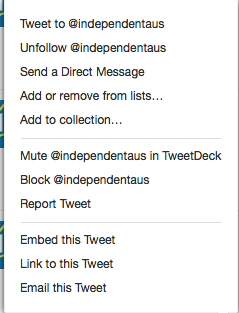 One of the options allows you to email the Tweet to those friends not on Twitter. So simple and so inclusive. Here’s what the menu looks like when you click on to the three dots “…”. Simply click onto “email this Tweet”. Once you start engaging on the Twitter thread, you’ll find like-minded people to follow who, in turn, will generally follow you back. I get three different media monitoring services on the environment every morning. These articles come from all over the world from a variety of major mastheads and scientific journals. I pick the best of the stories and Tweet the links out. Most of my followers are people who care about the planet and their grandchildren’s future. There’s always some heartening stuff to Tweet out on the environment as well — like the latest news in battery storage for solar users. I hope this post has been useful and, if you decide to join us on Twitter, you get as much fun and enjoyment out of it as I do. You’ll have to excuse me now. G2G! Dave is off to the cricket for the weekend. So, I’m in the editor’s chair as I write and an up-coming article by IA’s new contributor, John Maycock, (on whether Scott Morrison is the warm, cuddly being he now portends to be) is waiting to be Tweeted out! TTYS! Lyn Bender (@lynestel) – warning Lyn is even more “tragic” than I am. She even Tweets in the bath! Sandi has been tweeting since January 2011. She was a guest tweeter for two years for the Melbourne Writers Festival and also ABC’s Lateline. She guarantees to follow you back. This entry was posted in Media by skepticslayer. Bookmark the permalink.